No contemporary business can run without computer support. Whether you're using a laptop to stay in touch or work in the field, or need a complex fully-integrated network of computers linking everyone in your organization, your computers are vital. They have to work for you, with you, and together to keep all the information you need flowing smoothly. Because you can't afford a computer problem, you need reliable, professional technical support. That's where Teky comes in. Whether you are using us to service, maintain and update you systems, or need us to specify, supply and install a complete new network, Teky has the skills your business needs. You can depend on it. We'll remove the programs that are trying to damage your computer, circumvent your security, or sell you stuff you don't want. We'll also remove programs that you aren't using and are just slowing down your computer. We'll install or repair printer or scanner software as necessary. We'll repair or replace hardware as necessary. We'll recommend, provide, or install self-monitored security systems. With information about your Internet Service Provider, we'll diagnose and repair your Internet or email issues. 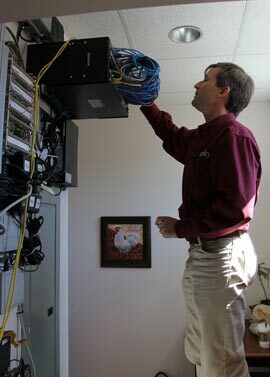 We'll set up or repair your network hardware and/or setup. We'll take the components out of boxes, connect them, load drivers and updates, and make sure they are online and secure. We'll transfer data from a past system, but may have to charge for the extra time involved if there is a lot of data to transfer. With your operating system product key, we'll install or repair your operating system to get it working, and then perform all updates. We'll install or repair printer or scanner software as necessary. We'll show you how to use what you have. We'll repair or replace hardware as necessary. We'll set your office up on a regular maintenance schedule. We'll run Cat5e or Cat6 cable through ceilings, walls and floors and terminate it with proper connectors and faceplates. We can set you up with an online backup (the best solution in most cases) or with an external hard drive (attached or via network). We'll remove the programs that are trying to damage your computer, circumvent your security, or sell you stuff you don't want. We'll also remove programs that you aren't using and are just slowing down your computer. We'll consult with you regarding VOIP technology. With advanced notice, we'll train you on any technical topic: general or specific.